Set Instant Pot or multicooker to sauté on high heat. Mix together the ingredients for the rub. Rub it all over the chuck roast. Add olive oil and roast to the Instant Pot. Let the roast sear on the outside (without touching) for 3 minutes on each side. Turn the sauté function OFF. Add in the remaining ingredients – except for the arrowroot – close the top. Set on Pressure Cooker for 1 hour at high heat. Once the cycle has finished cooking, release the pressure (about 5 – 7 minutes), then remove the roast to place it in a bowl. Tear the meat apart using forks and discard of the large pieces of fat. Mix a few tablespoons of the remaining broth with the arrowroot, then add the slushy mix back to the slow cooker. Stir it up to help it thicken. Add the shredded meat back to the slow cooker. Let it marinate for about 20-30 minutes, then remove the meat and potatoes and small portion of the gravy and place in a separate food container. This is done to save on calories. 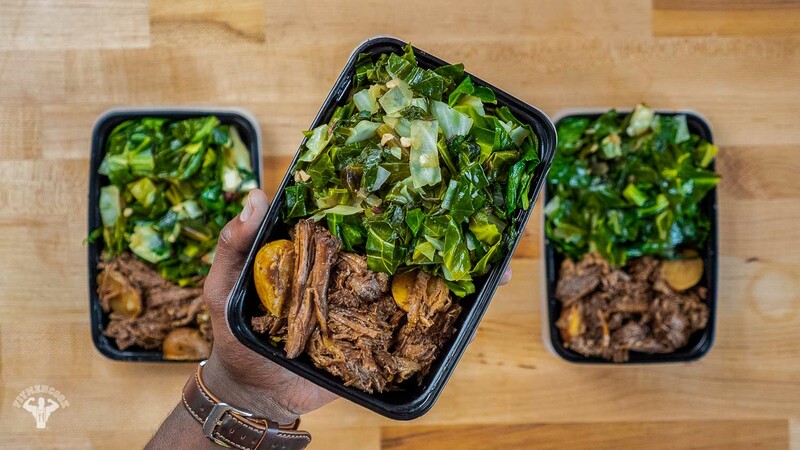 While the meat is cooking, prep the greens. Set a nonstick skillet on medium-high heat and add chopped bacon. While the bacon begins to cook and create grease/oil in the skillet, reduce the heat to medium and toss in the garlic and onion. Continue stirring and cooking until the onion turns brown and somewhat translucent. Add chopped collard greens and chard. Continuously fold the veggies in the skillet so they begin to wilt. After about 3 minutes, once the greens have wilted more, make a hole in the skillet and add chopped cabbage. Fold everything together. Sprinkle in some sea salt and pepper, then pour in the chicken broth. Reduce the heat to a low simmer on low heat, then cover and cook for at least 25 – 30 minutes. Season to taste with sea salt & pepper.